When Inayat Khan, the Sufi teacher, came to America some ten years ago, I met him in San Francisco and wrote an account of our association for a Japanese daily paper of that city. Inayat Khan succeeded in introducing Sufism into the Western World. Although he passed away several years ago, his books on Sufism as well as on other subjects have been well received in both America and Europe. The Sufi movement, therefore, still survives in the currents of thought to such an extent that it is now an important element in the world’s religion of the heart. Zen is not confined to Buddhism. In Christianity there is an element of Zen. It also appears in Taoism and in Confucianism, however colored by those respective schools of thought. I have been told that there is only one Sufi teacher in America, a woman residing in San Francisco, though there are several teachers of both sexes in Europe, mainly in England. The Sufi teachings, I understand, also have some influence in India. The teacher in San Francisco is Mrs. Martin, a Hebrew scholar, whom her students call “Murshida”, the Persian feminine form for the word “Murshid”, which means teacher. Inayat Khan is known to his followers as “Pir-o-Murshid”, and they consider him to he the greatest teacher of this age. Since the latter part of March he has been at the Sufi Temple, 153 Kearny Street, of this city [San Francisco], engaged in lectures and the personal guidance of his students. The Murshid was born in Baroda, India, having the well known musician, Maula Bakhsh, often termed the Beethoven of India, and also the saint, Jumma Shah, whom some Hindus even now worship, in his lineage. Inayat Khan is now 41 years old. He is a man of commanding personality, being quite tall and stout, and wearing long hair and beard. His bright eyes lend an air of dignity to his dark-colored face. He is author of more than ten books, which range through such subjects as art, philosophy, and poetry. He is also a poet and a musician in addition to his other accomplishments, and he is now lecturing on Sufism under the auspices of Paul Elder, the book-dealer, while the intellectual groups of San Francisco crowd around him. Mrs. Martin invited me to her home to meet her teacher, and as I had benefited very much by the use of her library over a period of several years, I did not hesitate in accepting her kind invitation. On my way there, I met Doctor Hayes, my old friend, the psychologist. “I am going to meet Inayat Khan,” I replied. Thus it was that the two of us went to the home of Mrs. Martin, the only Murshida in America. When we arrived we were ushered into the meditation room. It was dimly lighted by a lamp covered with green silk cloth, while fragrant Persian incense filled the atmosphere. After Mrs. Martin introduced us, and after shaking hands in the American custom with the Murshid, we were seated at a square table, Mrs. Martin facing Dr. Hayes, and the teacher facing me. My friend the psychologist began talking to the teacher by asking him how he liked America and its people, meanwhile selecting a cigar from his pocket, which, however, he hesitated to light at such a meeting. Inayat Khan smiled at me and asked, “Mr. Senzaki, will you tell me what the significance of Zen is? I remained silent for a little while, and then smiled at him. He smiled back at me. Our dialogue was over. At that point, Inayat Khan waved his right hand gracefully, and stopped the psychologist’s conversation. Before she could rise from her seat, Inayat Khan again waved-this time with his left hand-gracefully stopping the Murshida, then he glanced at me. A vast sheet of water as blue as indigo. The abyss has a depth of ten-thousand feet. Reaching the bottom easily and freely. “Mr. Senzaki, I see a Sufism in you,” he replied. Both of us then smiled at each other. At this both the Murshid and I laughed loudly, in which the Murshida and the psychologist both joined, without knowing why. The happy interview was over. I should have gone home at this time, but the psychologist seemed to wish to talk further with the Murshid and interpose his whys and becauses, while the Murshida, our Hebrew scholar, must show us her collection of books and documents. So we remained there the whole evening while we discussed Life, Death, Humanity, and the Universe. I noticed that the Murshid uses the Nyaya system of logic in making affirmations, and this made me feel very much at home with him, as we Buddhists use the same system. The Murshid told us his ideal of a universal brotherhood which he believes will be established, and which he thinks will transcend all racial considerations, as well as harmonize all religions to the extent that they will work together in harmony for the uplifting of humanity, and for the advancement of the spiritual world. Inayat Khan now has adherents in London, Paris and Geneva. May his brotherhood become stronger, year after year-let us sincerely hope for it. One day, Inayat Khan expressed the wish to attend a Japanese, concert. I could not find any that were billed for that week, so I went to Madam Nakamura, who teaches the koto in her home, and asked her to invite him to hear her play. She consented gladly, and I went to the Sufi Temple to tell Inayat Khan about this arrangement. It was about two o’clock in the afternoon, and the Murshid asked me to meditate with him in a secluded room where his pupils received personal guidance. We sat down to meditate together, but before even one stick of incense was consumed, both of us must have entered into Samadhi, for Mrs. Martin suddenly called us, stating that it was already dark, time for us to go home for our respective dinners. We looked at each other with surprise, but nodded a knowing assent to each other. The incense had been completely consumed so long that no fragrance remained in the room. 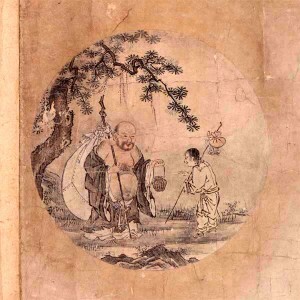 Both Sufism and Zen had become, after all, only yesterday’s dream. It was the evening of May 4, 1923, that we, Inayat Khan, accompanied by Mrs. Martin and me, went to Madam Nakamura’s studio. 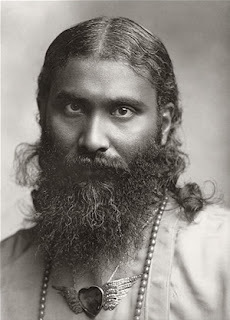 The simplicity of Inayat Khan’s manners and conduct on the way reminded me of the time when a certain Japanese high priest came to America, accompanied by a flock of attending priests, with a great show of pomp and ceremonials–he could not even move a hand without the assistance of his two chief attendants (the chief and his vice-chief). This high priest was the abbot of a certain Japanese sect, but with all his pomp and glory, his influence in America never reached an inch beyond the Japanese immigrants, and his appearances here went entirely unnoticed by Americans. On the other hand, Inayat Khan’s influence was widely spread among intellectual groups, both in Europe and America. He could have put on a “big show” of himself alone, if he had wished to do so, but he was not that kind of teacher. Wearing a Turkish hat and a long black mantle and carrying a cane, the Murshid modestly rode in the street-cars, instead of in a flock of honking automobiles. The concert at Madam Nakamura’s was a success. The first number on her program was Chidori (Plovers), played on the koto by herself, accompanied by another koto and a shakuhachi, played by one of her pupils and a Japanese youth respectively. The next and last number was The Three Intimates (the pine, the bamboo and the plum tree), which Mrs. Nakamura led on the koto, again accompanied by another koto and a shakuhachi. Although the shakuhachi was played by the same youth as before, the second koto was played by another of Mrs. Nakamura’s pupils. That evening all the players wore American dress, as it was an informal recital, but they sat on the floor in the Japanese custom for such performances. After definite expression, through keen attention and breathless silence, of his appreciation of the performance, Inayat Khan warmly praised Madam Nakamura, saying that she was music itself, not only with her koto but also even in drinking tea or in walking around the room. Madam Nakamura should appreciate this commendation very much, as the Murshid is a poet and a musician who is not given to flattery. Having been served with tea and cakes, and having been presented with pictures of other performances given by Madam Nakamura, Inayat Khan left the studio, saying that he would tell European musicians about the deep impression this music had made upon him. Now, Bodhisattvas, I have translated my old clipping. What do you think of Inayat Khan? If you wish to meet him today, just open the door and face the lovely shrubbery in front of this Meditation Hall....entire text and pics taken from james ford. More info in "Eloquent Silemce by Nyogen Senzaki.